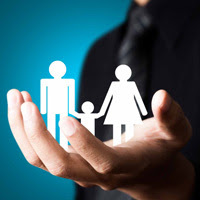 One of the key concepts of life insurance is that it can pay any dependents you have a cash lump sum or regular payouts upon your death. It has been designed as a way of providing you with a level of reassurance that those who are dependent on you are looked after should you no longer be around. The term life insurance policy runs over a fixed period, and will only pay out should you die within that period. No lump sum is redeemable at the conclusion of a term policy. The whole-of-life policy pays out irrespective of when you die.